I’ll be reviewing one of these each night for 3 nights. Before I decide which one to review first, are there any suggestions? Ionix is my favorite all time set from 99 so I’m thrilled to be opening a box. The original price on the box is $134!! Please check back tonight at 11 pm PST for the review. A couple weeks ago, Tim at 90’s Box Breaks busted a box of 1999 Bowman Chrome Series 1. Today, we’ll take a look at Series 2, the portion of the set containing most of the big names from the ’99 class. These names include C.C. Sabathia, A.J. Burnett, Alfonso Soriano, Adam Dunn, Carl Crawford, and Josh Hamilton, just to name a few. With a list like that, it should come as no surprise that these boxes can be a bit pricey, often running in the $75-100+ range. The Baseball Card Exchange currently has these priced at $65, the lowest price I could find so I bit. But was it worth it? Base set: As you gathered from Tim’s review, Series 2 contains 220 base cards: 70 red veterans and 150 prospects/rookies. My box yielded 72 of 220 basic cards (roughly 33%, 22 red, 50 blue) with 15 duplicates. Ironically, all 15 of my dupes were reds. International (1:12 packs): One big difference between Series 1 and Series 2 is the distribution of the International parallels. In Series 1, they are seeded at a rate of 6 per box. In Series 2, only 2 per box. My first pull was Tom Davey, who pitched 4 seasons in relief with the Jays, Mariners, and Padres, compiling a 7-6 record and a 4.41 ERA. My second pull was Kevin Eberwein, who played minor league ball for 5 seasons. I love city skylines on cards and wholeheartedly agree with Tim. These cards look a thousand times better on chrome than they do (regular Bowman) foil. Refractors (1:12 packs): Of course, no chrome set would be complete without the refractor parallels! In both Series, these are seeded at a rate of 2 per box. I pulled two rookie refractors: Brady Clark and Corey Patterson. It’s too bad Patterson never panned out the way many thought he would. It’s also too bad I didn’t pull this card in 1999. This card was huge then (just like that 2000 Asadoorian I pulled a couple years ago). International Refractors (1:50 packs, numbered to 100): The International Refractors in Series 2 are a little easier to pull than those in the first series (1:50 packs as opposed to 1:76 packs). Check out the scan. These cards are stunning. Even though I pulled Garret Anderson (059/100), I’m not entirely disappointed. That should say something about these cards. 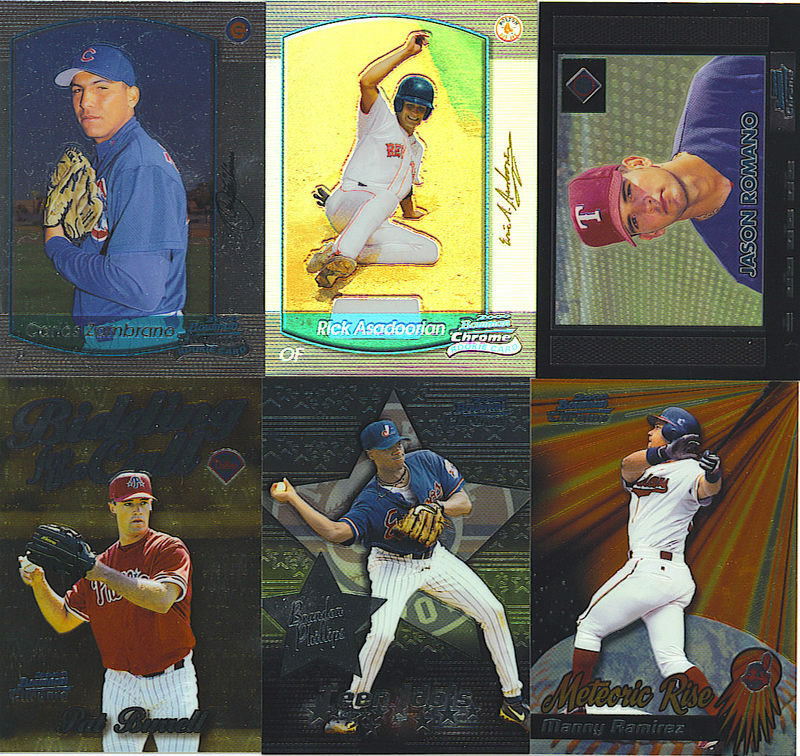 2000 ROY Favorites (10 cards, 1:12 packs): A common insert of past Bowman products, the 2000 ROY Favorites showcased some of baseball’s best prospects from a decade ago, including Pat Burrell and Alex Escobar. Refractor versions are found 1 in every 100 packs on average. Impact (20 cards, 1:15 packs): While the ROY Favorites set focuses only on prospects, the Impact set features a mixture of both veteran stars and prospects, as evidenced by the Joe McEwing and Alex Rodriguez above. Both sets are exclusive to Series 2. Impact refractors are seeded 1 in every 75 packs. 15% of the box’s contents were duplicates. That drives me particularly insane when there are only 96 cards in a box and 220 cards in the basic set. If you go back and do the math, you’ll see that I got 37 red cards but of only 22 different players. The greatest thing about this box was the fact that the cards were in tremendous shape. No dings, creases, scratches…nothing. I was very pleasantly surprised by this as I usually get at least one card in every box that is mangled straight from the pack. 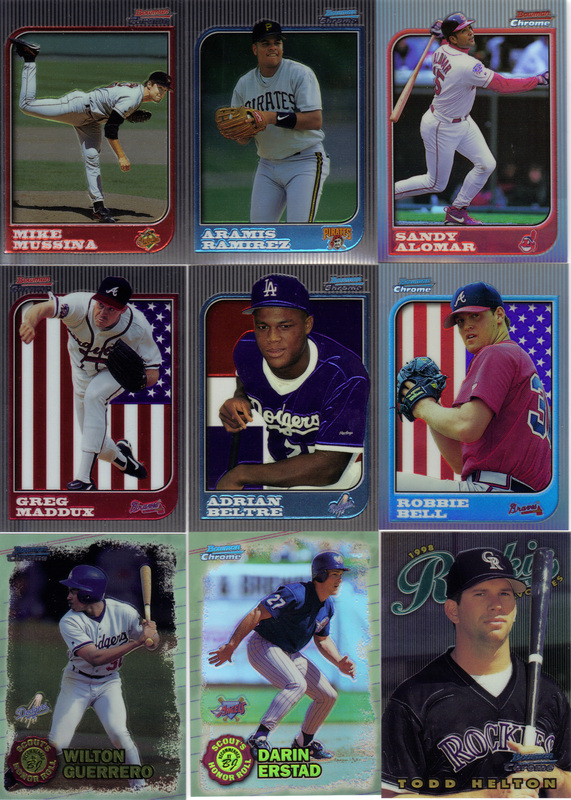 Overall, I was hoping to score one or two more big rookies, rather than David Eckstein (ugh). Despite the fact that some of the pulls were very lackluster, the International Refractor brought this box’s score up a bit, to a little better than average in my opinion. And like I said earlier, the Patterson would’ve been a big card around this product’s time of release, but who would want it now? If any Cubs fans in the blogosphere are interested, let me know. I must say that I probably wouldn’t have even considered breaking this box if I had to pay anywhere near the $100 mark for it. Remember, the only guarantees in this box are 2 refractors, 2 Internationals, 3-4 ROY/Impact inserts, and a handful of rookies. There are tons of great names to shoot for and if you’re into the whole grading thing, they should grade pretty high if they come out like my cards did. For $65, I figured it would be worth a shot and while I wasn’t totally disappointed with my results, I surely would’ve been if I had to shell out the extra $35-40 only to find that all but about 4-5 of my rookies were on the level of Peter Bergeron, Bubba Crosby, and Guillermo Mota. I’d proceed with caution on this one, at least if you end up paying top dollar. Earlier tonight, I was excited to see a post for a 1997 Bowman Chrome Baseball box break from Houston Card Collector. I was going to prepare myself for the second-ever Old School Breaks Grudge Match when I started to watch his video. In the first Grudge Match, I compared box breaks of Pinnacle Certified with Mario of Wax Heaven. As for the Bowman Chrome, it really wasn’t going to be much of a contest. I figured that Houston Collector’s box destroyed mine about halfway (if even) into the video, which can be seen here. The video is a bit long, but it’s definitely worth checking out. And if you’re reading this Houston Collector, congrats! It’s always nice to pull something for the PC. To see the results of the box I broke nearly two months ago, click here. Base set: There are 300 cards in the set: 100 veteran “Reds” and 200 rookie/prospect “blues.” My box yielded 30 reds and 53 blues, or 83 of 300 basic cards, for 27.67% There were no duplicates in this box. Some of the key rookies included Miguel Tejada, Vernon Wells, Aramis Ramirez, Kerry Wood, Adrian Beltre and to a lesser extent, Orlando Cabrera and Jose Cruz, Jr.
International (1:4 packs): Inserted into every fourth pack on average are the International parallels which feature the flag of the player’s country of origin in the background. My pulls were of Adrian Beltre (RC), Greg Maddux, Moises Alou, Todd Greene, Marlon Anderson, and Dermal Brown. Refractors (1:12 packs): Where’s there’s chrome, there are refractors. My refractors were Sandy Alomar (who I didn’t think would ever stop playing) and Brett Tomko (who is surprisingly still playing). Scout’s Honor Roll (1:12 packs): Seeded at two per box are the Scout’s Honor Roll inserts. These inserts are made to look like a notepad and if you look at the back, you’ll see a mini evaluation of the “five tools” each prospect is judged on: hitting, power, speed, defense, and arm. I pulled a Kevin Orie and Wilton Guerrero. A refractor version can be found in every 36 packs on average. I found a refractor of Darin Erstad in this box. 1998 ROY Favorites (1:24 packs): Finishing this box off are the 1998 ROY Favorites inserts. This set features just the best baseball prospects of the time. These cards are borderless and feature an up-close portrait shot of the player. I pulled a Todd Helton. The refractor version of this insert is seeded 1 in every 72 packs. Final Thoughts: I thought this was a decent break overall. The refractors and a couple of the insert pulls were undoubtedly weak, but this was made up for by the rookie pulls, which is what I was more focused on. It would’ve been nice to pull a Berkman though and really nice to pull a shiny one with a flag background! Base cards: There are 440 cards to the single-series set, of which I pulled 85 without duplicates. There are 140 veterans and 300 rookies/prospects in this set. As always, the vets have the red theme while the youngsters have the blue. Some of my rookies included: Carlos Zambrano (yes!! ), Kevin Mench, Brett Myers, Jody Gerut, and Bobby Bradley (a HS phenom who went busto with Pittsburgh). Also, each box contains 1 oversized box-topper, which feature 1 of 8 different players. I got Pat Burrell. Retro/Future (1:6 packs): Retro/Future is the most easily attainable of 3 different parallel sets in this product. 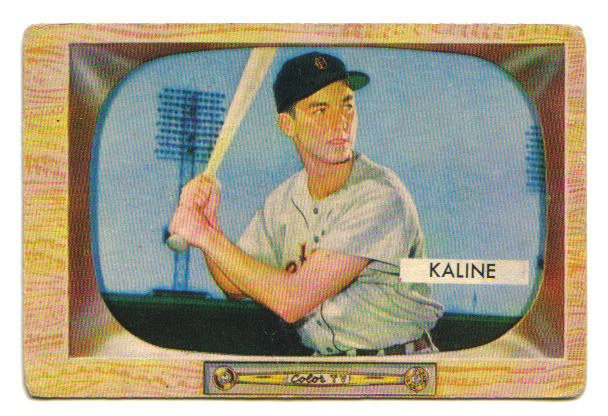 Seeded 4 per box, these cards are horizontal in design and feature the player inside a mock television set, similar to 1955 Bowman. The veterans are featured in an old-school 1950’s television, while the prospects get a much more modern version. My pulls here were Magglio Ordonez, Pablo Ozuna, Jason Romano, and Mike Venafro. These also come with a refractor version which fall 1 in 60 packs on average. Refractors (1:12 packs): The other parallel I have to mention is the refractor set which fall at 2 per box. They look like your standard refractors, but there’s one key characteristic about them. The player’s facsimile signature is highlighted in gold. Why is this important? In 1999 Bowman Chrome, there was a Refractor parallel which fell 1 in 12 packs and a Gold Refractor (basically just the refractor but with a gold sig) which were limited to 25. Don’t confuse those 1999 parallels for what’s in the 2000 product. Aside from the retros, there’s only 1 type of refractor! My first refractor was Derrin Ebert, who only pitched in 5 career games, all with the Atlanta Braves. The second was……WAS a big hit at the time, Rick Asadoorian. Red Sox fans (the real ones, not the bandwagoning scum) probably remember how highly regarded this kid was. He was a first-round draft pick in 1999 when he was only 18! The card says he had been compared favorably to Dwight Evans and if I remember correctly, his Bowman’s Best RC out of 2999 booked at $100 at one time. For the record, the only card in that set currently worth that much is Johan Santana! Bidding For the Call (1:16 packs): Here’s a standard prospect-filled insert set highlighting the best prospects in the game. It’s an attractive insert with a gold background. Once again, I pulled Pat Burrell. At least I didn’t get Scott Sobkowiak, whoever that is. There is a refractor version found 1 in 160 packs. Teen Idols (1:16 packs): The 15 players in this set all had pro experience prior to their 20th birthday. I don’t know about the rest of you, but knowing the theme of the set makes one name in particular pop into my head: Joe Nuxhall……or Ken Griffey, Jr. Whatever. I did pull a Junior insert here and as an added bonus, also found a Brandon Phillips. I totally forgot Phillips was an Expo, along with Grady Sizemore. The refractor version of this set is found 1 in 160 packs. Rookie Class 2000 (1:24 packs): Here’s another prospect set found approximately 1 per box. This time, I pulled A.J. Burnett. This card is pretty plain for a chromium insert, but the player’s name and team logo appear to be inside of a comic “speech bubble” on the front. The refractor version of this set is found 1 in 240 packs. Meteoric Rise (1:24 packs): This is the lone veteran insert set of the bunch. Thanks to these cosmic inserts, we learn that the earth is really just one gigantic baseball. See for yourself above. My pull was Manny Ramirez, who often seems to be in his own world anyway so it fits perfectly. Like all the other insert sets, there’s a refractor version to be found, 1 in 240 packs to be exact. Final Thoughts: Like I said earlier, this probably isn’t the first set you’d think about when it comes to the Bowman Chrome franchise. It doesn’t have the biggest marquee names or autographed cards, but it still delivers for the price you’d pay for a box (which should be under $40). It has some unique and attractive inserts and parallels, especially the Retro/Future cards. If you are looking to build a set, it would take several boxes (duplicates aside) to complete so keep that in mind before you buy one. Remember this is a single-series set, with 440 cards and 4 cards per pack. You do the math. If you decide to go for a box or two, I wish you the best of luck. Hopefully you’ll end up with a sick Oswalt or Zambrano refractor!